Can U spell or waz up heh? Seeing an obvious spelling mistake like ‘Voltoge’ instead of ‘Voltage’ is normally a cause for concern. Especially if it is on the top of your product for all to see; if they can’t get that right, what else did they miss? Well the instructions are absolute crap (yet funny to read), but all the pieces were there so no problem getting to the point of plugging it in and adding eggs. One of those trade-off situations I guess; pay US$100 for an incubator delivered so expect some trim around the edges. 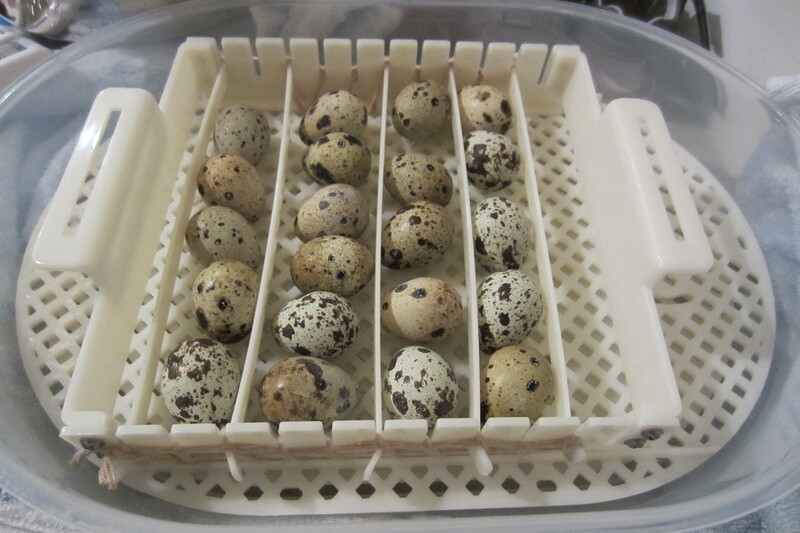 21 quail eggs all ready to go. Could have fitted in more but really, 20 odd quail chicks is more than enough to keep me busy. Due to a design flaw (as in NO design), those plastic barriers will shift upwards unless locked into place. You need them there at egg level to ensure they are rotated when the tray container is moved from side to side. Those eggs will not give you chicks unless they are rotated frequently. My twine repair job seemed like a good choice. 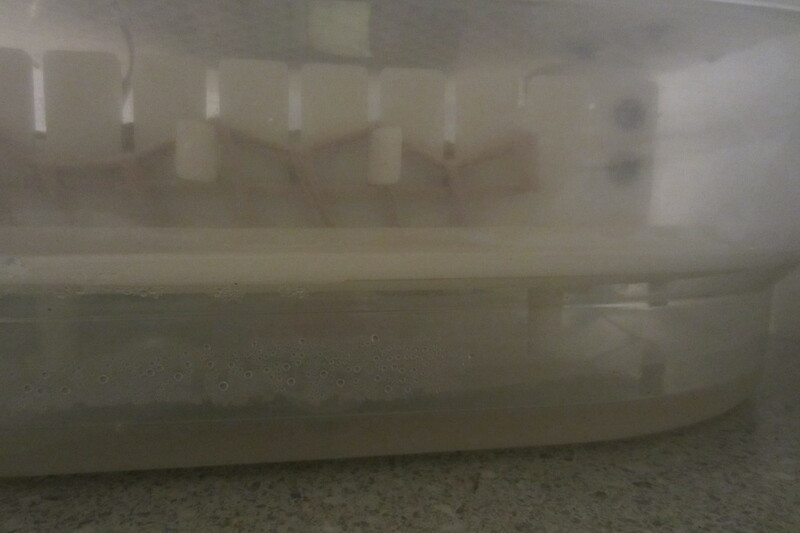 About 100ml of warm water is added into the base of the tray to encourage humidity. This should be done every couple of days. 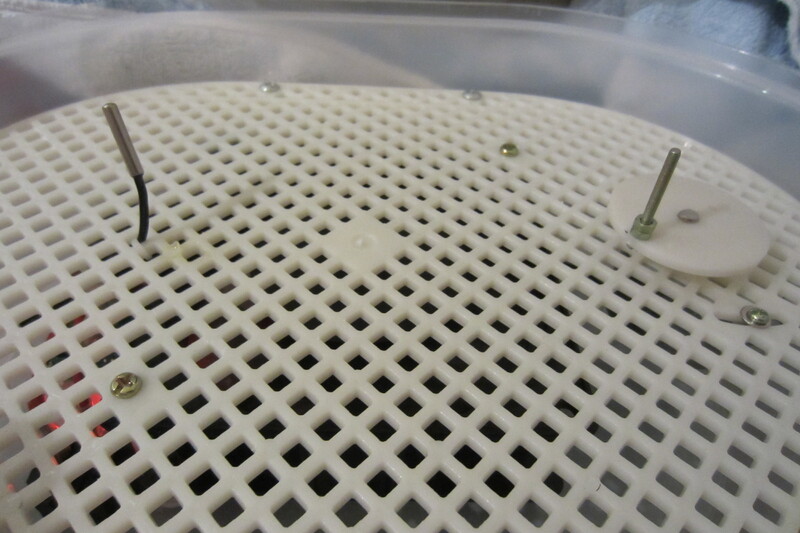 The temperature sensor on the left – rotating arm on the right. I had to pull the sensor down (gently), to get closer to the eggs, but for chickens eggs it would have been at the right height. The rotating arm is almost silent and ran efficiently. The incubator heats up or cools down in response to the temperature of the room it is in, so be mindful of those conditions. 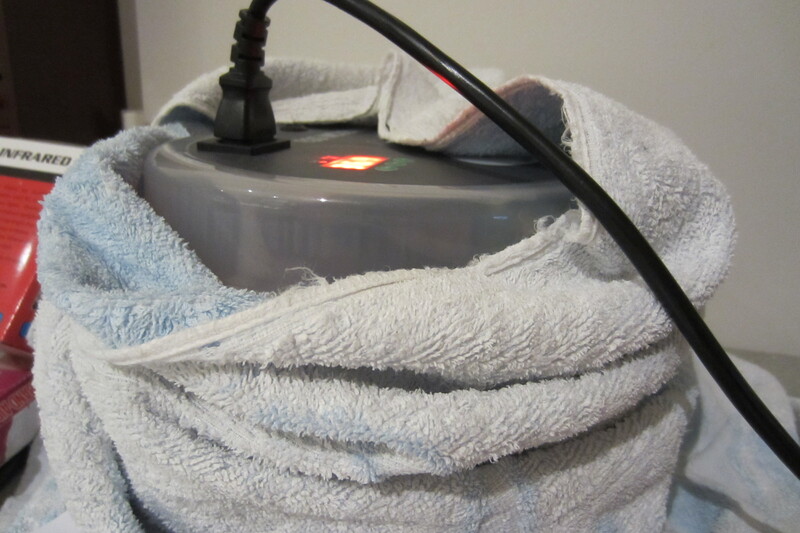 Wrapping a towel around it helps maintain an even temperature and lessens the load on the motor. This happened to me with the first batch – I came home from work on what was a hot day and the incubator temperature was 38.5c. Do keep an eye on that because it can literally kill off all your hard work. At 37.5°C you have about 15 days to pipping for quail, about 18 for chickens, and 25 for ducks. Pipping is when the chick starts to break into an air sack within the egg, and then following this, will start to break through the shell. It is an amazing thing to watch. You can tell it is happening by watching the eggs, and this can be tricky with the JN12 due to the plastic lid. I found that by resting the lid to the side of the case allows the warm air to continue running over the eggs, up to about 5 minutes should be fine. The eggs will jump, rock, spin, and pivot, just like some kind of magic trick. Like I say it is an amazing thing to watch. Adjust the temperature down half a degree to 37.0°C – do this by holding down the ‘Set’ button and pressing the ‘-‘ button 5 five times. The birds need humidity to break through the shell, otherwise you will experience high numbers of ‘Dead in Shell’. It ain’t pretty let me tell you. The eggs should hatch within 3-5 days of pipping. So Does the JN12 Deliver? The professionals would call it a science, but for the first time home enthusiast there is still so much to learn. Lucky for me I had a good incubator, which I guess is the conclusion of this review. Conclusion – The JN-12 is worth buying (in the US$100 price range), and will suit the needs of an amateur breeder. If you are into quail like me, then I strongly recommend you read the books Keeping Quail, and Incubation: A guide to Hatching and Rearing, both by Katie Thear. Between the two of these you will have everything you need to see it through. Tags: Egg, Japanese Quail, JN12 Incubator, Quail. Bookmark the permalink. 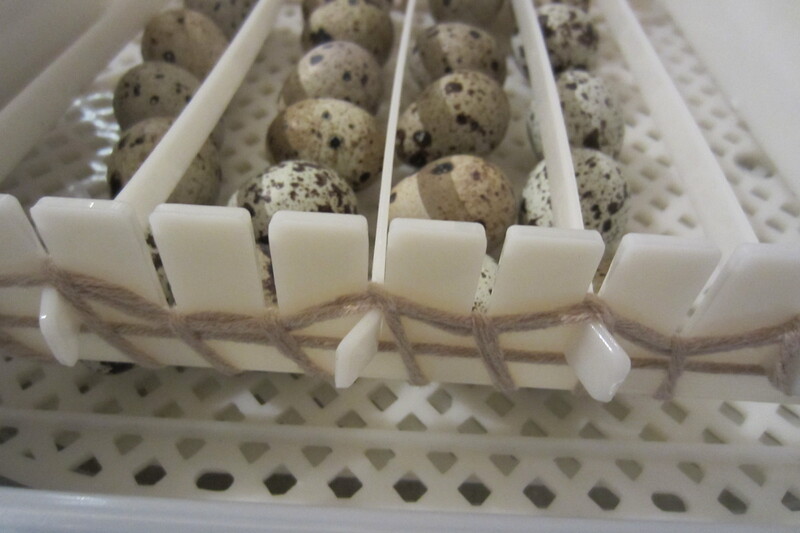 How long do you have the quail eggs turning for before they start to hatch. Hi Linda – about 15 days to get them cracking through. Ahhh, do you order your eggs through the post? I used ones laid by my strongest girls. It’s possible that’s more of an issue than anything that you are doing. Might be worth checking with the supplier of the eggs also. When you added 100ml of water did you not get very high humidity. Around 75%. I have done a couple hatches but never tried the 100ml because of this. Did it worry you at all or should I? Hi Braden, I found 100ml worked just fine for me and resulted in a very successful hatch rate. How much water do you normally use? Wow, you are running a much more sophisticated operation! I added enough water to make sure that it didn’t run out during the day while at work, and kept my fingers crossed that the whole thing hadn’t broken by the time I got home. How are your hatching success rates? Hi Shane just did some research and i think i found some instruction at http://natureaquarium.co.uk/?page_id=1100 I think it will help. 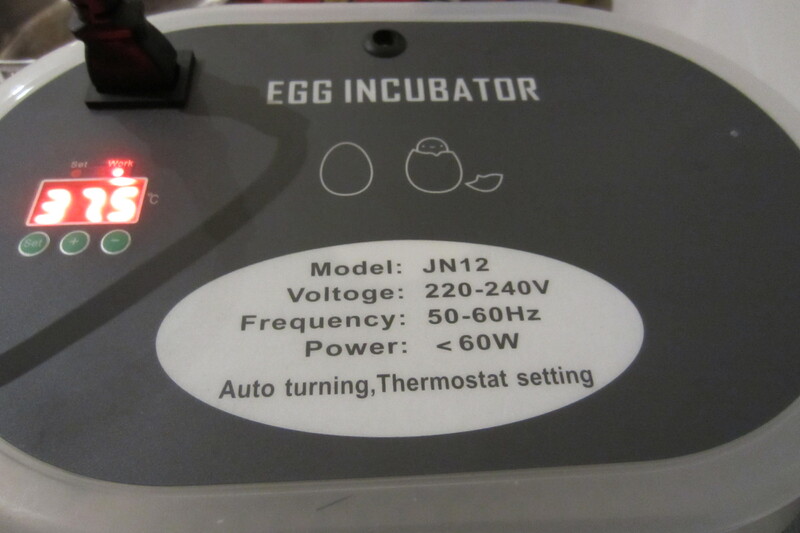 I’m about to buy an incubator for the first time and I feel the JANOEL12 may be the right choice. Her I have ordered the same incubator and waiting for it to arrive, just a question did u only use the thermometer included or did u purchase another to add, I have heard so many different things about using extra ones…..Also love the video, so adorable. Hi Wendy, was this for quail? Chickens take longer. I noticed that the link to the instructions are no longer there so will need to find another source. Follow my guidelines as best you can and if possible try another batch – you never know for whatever reason they may have been bad. do you have to set the amount of times the eggs get turned with this incubator? Hi Tina – No the machine will move them around but I’d recommend turning them by hand every few hours when it’s possible, but don’t leave the lid open for more than a minute of so. Don’t worry about doing this overnight as somehow it all works out in the end. The two no-growth eggs shouldn’t be attributed to the model of incubator. I’m sure you didn’t mean it that way, but it does almost come across like the JN12 had an 82% success rate on your first trial, rather than the general success of your eggs. Yep spot on mate – I’ll need to change it. Will discount the no growth ones from the formula. Thank you for calling out what is in fact very obvious! !